perumAL does not live quite happily in the hearts of those who seek and yearn for anything apart from HIM. This forms the message in this pAsuram. In the previous pAsuram, swami aruLALa perumAL emberumAnAr described how happy perumAL is in the hearts of HIS pure devotees. He is indeed happier than being in srivaikuNtam. However, in this pAsuram, he says that even though perumAL lives in the heart of a person who goes after anything other than perumAL, HE will not enjoy it but will continue to stay there just for the sake of it. nALum ulagai naliginRa: rAvaNan, the ruler of LankA, was a personification of evil. The phrase “nALum ulagai” describes how bad he was. He was a person who tortured not for just a day or just for some period of time. His bad deeds continued daily. It is not just a few people who were tortured. He tortured the whole world. Thus, the mighty rAvaNan not just tortured a few people just for a short period of time. He cast his wrath upon everybody continuously. vALarakkan: rAvaNan did penance upon sivan and got a sword called “chandrahAsam” from him. He was able to defeat his enemies with considerable ease with the sword. kambar says“sankaran kodutha vALum” in his kambarAmAyaNam to describe this. thOLum thalayum thuNiththavan: rAman cut asunder the 10 heads and 20 shoulders of evil rAvaNan. Swami nammAzhvAr exclaims “nIl kadal sOOzh ilangai kOn thoLgaL thalai thuni seydhAn thaaLgaL thalayil vAngi nAL kadalai kaLimin”. Whenever a fight erupts between two people, if one of them grows weaker and weaker by every passing minute, the stronger person at one point of time, would realize his hold on him and at some point of time would kill him or defeat him totally with the thought that he should not let the weaker person to come up and fight back. The stronger person would want to annihilate him or his forces completely. However, the omnipotent, valorous rAman did not want to do the war this way. He wanted to give rAvaNan as many chances as possible for him to realize his mistake and fall under the lotus feet of rAman. This is why he cut his 20 shoulders one by one and then 10 heads one by one. He also let him away by saying “Go now today and come back tomorrow”. rAman was full of grace but rAvaNan did not surrender to HIM at all. All these acts of rAman were extolled by AzhvArs. pU madandhai kELvan: perumAL is the consort of pirAtti who resides on the beautiful, young, fresh and ever-radiating lotus flower. rAvaNan was destroyed not only because he was torturing all the people in this world but also because he was the villain who separated perumAL and pirAtti. This was the most important reason why he and his army was annihilated by rAman. Swami Thirumangai AzhvAr corroborates this in his Periya Thirumozhi pAsuram below. 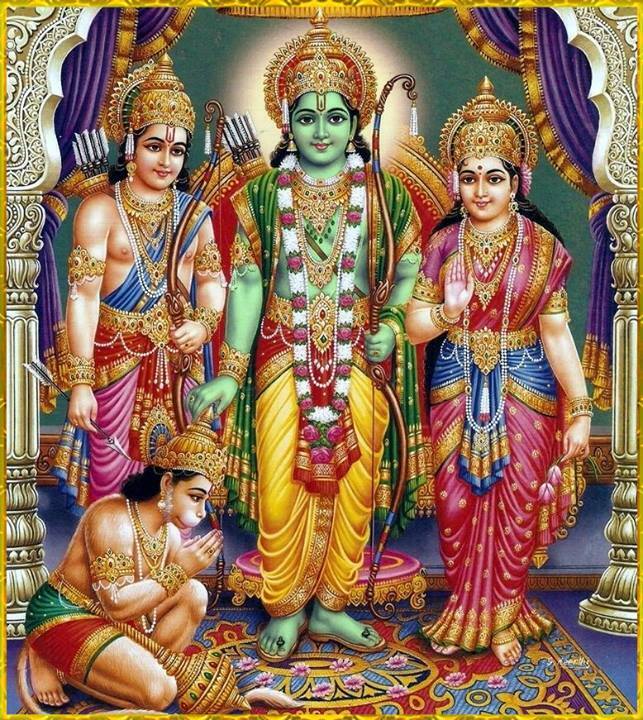 At this juncture, one may get a thought that rAman was selfish and hence HE destroyed rAvaNan, when the latter took away the former’s wife. This may look selfish if it is not being looked at the right perspective. One needs to understand the broadness of thought rAman had. If pirAtti was not there, then it is not only perumAL’s loss. More than perumAL, the people of the world can never live without her. It is because of her that perumAL gets the qualities of compassion, grace and forgives our sins. If not for her, then all the jivAthmAs like us cannot do saranAgathi at all. perumAL cannot protect us if pirAtti is not by HIS side. This can be seen in many instances. All the killings in sriramayaNam happened when piratti was not with perumAL. vAli, kara, dhOOshaNaN, rAvaNan, kumban, nikumban etc., all were killed when pirAtti was not with perumAL. At the same time, a demon known as “kAkAsuran”, who was in a crow form, stung pirAtti’s breasts with its beaks. Blood started to ooze out at that time when perumAL was lying in her lap. She did not want to disturb perumAL’s sleep. But when perumAL woke up and understood what happened, the demon ran for help. No one, no demi-gods, no rishis could come to its rescue. Even perumAL did not want to help. But it was pirAtti who intervened and out of her sheer compassion for her child (everyone is a child to her), she made her rAmA forgive it. Thus, it is only because of the thought that “people needs to be saved and to be saved I need pirAtti”, rAman had to kill rAvaNan, who apparently separated the Divine couple. than – thALil porundhAdhAr uLLaththu: Swami aruLALa perumALemberumAnAr talks about people who catch hold of perumAL’s Lotus feet. But even after that, these people start to wander and look for other material benefits forgetting where they are. “porundhudhal” refers to “match”. If one were to completely surrender unto the Lotus feet of perumAL, then how could it be possible that they can desire for other stuffs apart from perumAL? This apparently contradicts each other and so is looked upon as a “mis-match”. This is because the person did not do complete surrender or is looking for some other worldly benefits and not perumAL. irundhAlum: Everyone and everything has connection with perumAL. There cannot be any object or any person in any universe without HIS connection. HE is present in us, inside the jIvAthmA which is extremely tiny. He is present in all animals, birds, all species in this universe. He is present as fire, earth, sky, water and wind. He is present in the letters that we speak, write and think. He gives meanings to these words and becomes the One who is being described by the words. HE is beyond them as well. He exists as the very thought, action, cause, problem, solution and what not. Everybody is a vasihnavan in this aspect. He is there, even inside rAvaNaN whom we saw earlier. But, in the heart of those persons described as “porundhAdhAr”, HE resides just for the sake of it. However, in the case of HIS true devotees, HE enjoys it being there, much more than what HE enjoys at this ever-lasting, celestial abode of srivaikunNam. muL mEl iruppu: In the vast majority of people who think about anything and everything other than HIM, he stays just for the sake of it. He is living as if HE is on top of a prickly thorn. He does not like and love to live there but continues to stay for the heck of it. This entry was posted in gyAna sAram, Other on February 3, 2015 by santhanam rajagopalan.